Something borrowed, something blue—that is what Samuel P. Langley, director of the Allegheny Observatory in Pennsylvania, was counting on in July 1878 as he waited on Pikes Peak, Colorado, for the wedding of light and shadow displayed by a total eclipse of the sun. At his eye was a telescope borrowed from the U.S. Naval Observatory. Over his head, a sky he reported to be a "deep and transparent blue." The stint of fair weather was a welcome contrast to the preceding seven days of rain and hail, during which Langley had to transport all his equipment, including this five-inch equatorial refractor made by Alvan Clark & Sons, up Pikes Peak. The scope wasn't exactly light, a fact with which the donkeys tasked with hauling it up to some 14,000 feet would have surely agreed. In a desperate measure to protect the steel components of the telescope from water damage, Langley poured lard over it. If that weren't enough to turn one's stomach, the altitude was. Langley and others in his party severely suffered from "mountain sickness." He described the condition in his report to the U.S. Naval Observatory as a caution to future researchers who sought to obtain clearer observations in the thinner mountain air. All this fuss over equipment is ironic considering Langley would spend the bulk of his time observing the total phase of the solar eclipse with his unaided eye. (Learn about eclipse safety.) As soon as the moon completely blocked the bright disk of the sun, he sketched his impression of the shape and extent of the suddenly visible solar atmosphere, or corona. Because the corona is so much dimmer than the sun, an eclipse provides one of the easiest ways to observe it. Langley was surprised that the corona appeared dimmer and far more extended than he had seen before. In a coordinated effort organized by the U.S. Naval Observatory, many other observers at multiple locations also created sketches of the corona and submitted them for study and publication. Sketches of the corona during the 1878 eclipse by various observers. Courtesy of Astronomical and Meteorological Observations, XXII, U.S. Naval Observatory. The real surprise came after Langley finished his sketch and looked through the telescope. He had only five seconds to observe an "extraordinary sharpness of filamentary structure" of the corona before the sun started to reappear. This structure would haunt him. Photographs taken during this and later eclipse expeditions failed to reproduce what he saw. Was it a figment of his imagination? One has but to look at the variety of drawings from the 1878 eclipse to see how questions of subjectivity could come to play. 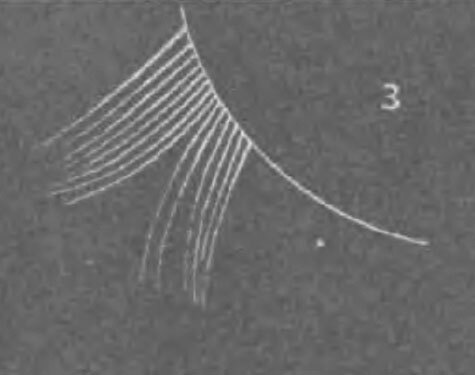 When Langley had a chance to witness another eclipse in May 1900, he decided to capture images of the corona with "photography upon a greater scale than any hitherto attempted." By then, he was the Secretary of the Smithsonian and head of its Astrophysical Observatory. He had considerably more resources at his disposal, including $4,000 from the government to study the eclipse. Langley formed the party from staff at the Smithsonian, Catholic University, the U.S. Coast and Geodetic Survey, Williams College, and the U.S. Patent Office. And this time there would be no need to worry about steep mountain hiking, sickness, and freezing rain. The eclipse path crossed the small town of Wadesboro, North Carolina, about 400 miles from Washington, D.C., and accessible by train. Since Wadesboro was an ideal place to observe the eclipse, other expeditions chose it, which meant a serious influx of astronomers. As "some slight return" for the hospitality extended to the team, the Smithsonian observers invited townspeople to look through a five-inch visual telescope to view the stars on clear nights. That scope was the same one that Langley had borrowed from the U.S. Naval Observatory for the 1878 eclipse. He borrowed it again. Borrowed telescope, borrowed lens—and this from the head of the Astrophysical Observatory of the Smithsonian? What a mooch! Well, hold on a second. Let's not be hasty to judge. It makes sense that Langley would want to use the same telescope in Wadesboro that he had used on Pikes Peak. That is good science. Minimize the variables so you can confidently ascribe any observed change. Borrowing large lenses and other telescopes also makes sense because his Astrophysical Observatory was more concerned with studying the various wavelengths of light from the sun than with making pictures of it. Langley was especially interested in parts of the solar spectrum that were not visible to the naked eye. He developed an instrument to measure infrared radiation, the bolometer. And the Wadesboro expedition was an early attempt to use such an instrument to study the solar corona. While Langley enjoyed the view through his borrowed telescope, two other researchers sat in a small hut and took readings from the bolometer. Perhaps the excitement of this unfolding field of study was enough to cheer Langley up after he finished watching the 1900 eclipse. "To the writer's view with the 5-inch telescope the inner corona was filled with detail, but far less sharp and definite than he saw it on Pikes Peak in 1878," Langley later wrote. "Having in mind the wonderful structure seen with the same instrument in the clear mountain air twenty-two years before, the impression was a disappointing one." Humidity could have been to blame, or even changes in the sun itself. Whatever the cause of his disappointment, it is hard to believe that anyone could look upon this telescope, learn about the eclipse expeditions it was used for, and be disappointed. Kristen Frederick-Frost is curator of modern science in the Division of Medicine and Science. Planning to view the total solar eclipse this summer? The Smithsonian Eclipse app is your interactive guide to the big event.